Discussion in 'Blu-ray and UHD' started by Timothy Bodzioney, Feb 10, 2019. The popular opinion with Popeye shorts is the series jumped the shark when Popeye joined the Navy with "You're a Sap Mr. Jap" and never really recovered so its not surprising to be disappointed by these mid-40s Famous era shorts. Mr. Bodzioney, needy orphans can be of any age, so don't make fun. Granted these are not the "best of the best" of the shorts but nevertheless they warrant a purchase and viewing to put things in perspective. To my knowledge these have never seen the light of day on home video of any kind. As stated in the review, it is important that if you support classic animation to be released on any physical format, to consider purchasing this volume to help convince Warner that there is a market for these releases. I was thrilled myself when this was announced and pre-ordered in the hopes that not only would we get future volumes but am extremely hopeful that we would get a reissue of the earlier Fleischer shorts on blu ray. That, of course, remains to be seen. These look amazing and I love them because I remember seeing them when I was a little kid. I even remember Pop-Pie a la Mode. My friends and I kept quoting the last line, "Salami, salami, baloney!" As flawed as they are, I'm thrilled that we have them because of their historical value. Posters toss around the words "flawed" and "lackluster", but that seems to be mostly in comparison to the superior Fleischer shorts. 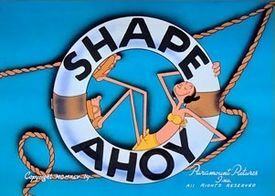 Held up against Terrytoons or some Columbia cartoons of the period I would still consider the Famous Popeye shorts very good examples of 1940s animation. Certainly the art and technical aspects of the cartoons are top-notch, with great use of squash-and-stretch. These films were very popular in their day for good reason. The cartoons in this set may represent the top of the slippery slope of monotony that Famous Studios really hit full speed with Casper ("A g-g-g-g-g-ghost!") and Baby Huey (You're not my Ma -- you're the Fox! "), but at least this first color set makes me smile fairly frequently. Timothy Bodzioney and RBailey like this. warnerbro and Detour (1945) like this.